Lake Havasu City, AZ –Mohave County Supervisor Buster Johnson was invited to Washington D.C. this week by the Committee on Natural Resources to testify in support of Congressman Gosar’s Bill H.R. 2663. This legislation, titled the Public Land Renewable Energy Development Act of 2015, presents a bipartisan opportunity to expand renewable energy development on public lands, while at the same time maximizing benefits to states and counties. “In large public lands counties of the west, like Mohave County, the costs of providing essential services on public lands can be significant. This legislation establishes a distribution where 25% would be shared with county governments. 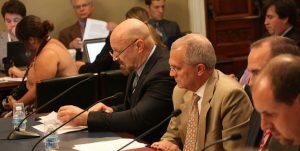 For counties, revenue sharing is a critical component of this bill,” Supervisor Johnson said during his testimony to the House Subcommittee on Energy and Mineral Resources. Johnson testified before the Subcommittee on behalf of himself as Vice Chair of the Mohave County Board of Supervisors, the National Association of Counties (NACo), as Chairman of the QuadState Local Government Authority and as Co-Chair of the Arizona/Utah Economic Development Coalition. H.R. 2663 establishes a new revenue structure which would distribute royalties to affected states, affected counties, the U.S. Department of the Treasury and the “Renewable Energy Resource Conservation Fund.” “Sharing royalties with counties will help provide local taxpayers with additional relief from the costs associated with tax-exempt federal land and it will provide the much needed resources we need to provide critical infrastructure and services on public lands,” Johnson explained. A recent University study found that if this bill were enacted Mohave County would receive $519,375 in royalty payments from existing renewable energy projects. Supervisor Johnson has chaired numerous State and National committees focusing on renewable energy development over the years and is well aware of the challenges renewable energy developers face when it comes to developing on public lands. “This legislation creates a straightforward and streamlined permitting process for renewal energy development on federal lands. Simply put, there is no reason for the BLM to take several years to permit a project when our county offices can issue permits in weeks,” Johnson said. Mohave County’s climate and landscape offers some of the highest solar and wind energy potential in the nation. “In public lands counties, the single greatest barrier to project development is the protracted federal permitting process which is simply not an issue on private lands. The streamlining provisions included in the bill will lead to faster turnarounds, and will help create good paying jobs, diversify rural economies, and spur economic growth,” Johnson stated. “I would like to thank Congressman Gosar for his leadership and for the introduction of this much needed legislation,” Supervisor Johnson ended.